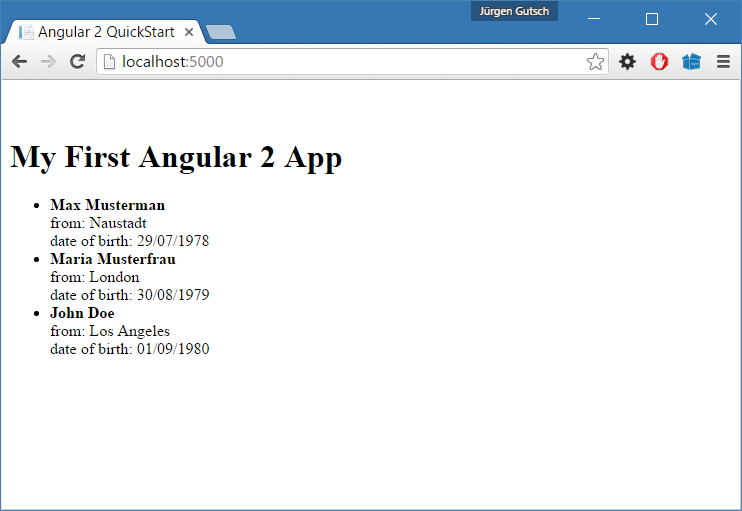 How to host an Angular 2 app inside ASP.NET Core, using dotnet CLI and Visual Studio Code. This is another post about ASP.NET Core and Angular 2. This time I use a cleaner and more light weight way to host an Angular 2 App inside an ASP.NET Core Web. I'm going to use dotnet CLI and Visual Studio Code. A few days ago there was an update for ASP.NET Core announced. This is not a big one, but a important run-time update. You should install it, if you already use ASP.NET Core 1.0. If you install it the first time (loaded from http://get.asp.net/), the update is already included. Also since a few days, the final version of Angular2 was announced. So, we will use Angular 2.0.0 and ASP.NET Core 1.0.1. The first step is to create the ASP.NET Core web application this is the easiest thing using the dotnet CLI. After downloading it from http://get.asp.net and installing it, you are directly able to use it. Choose any console you like and g to your working folder. If you used the dotnet CLI for the first time it will take a few seconds. After the first time it is pretty fast. Now you have a complete ASP.NET Core quick-start application. Almost the same thing you get, if you create a new application in Visual Studio 2015. This takes a few seconds, depending in the amount of packages or on the internet connection. If this is done, type dotnet run to start the app. You will see an URL in the console. Copy this URL and paste it into the browsers address bar. As you can see, you just need three console commands to create a working ASP.NET application. To support a Angular2 single page application we need to prepare the Startup.cs a little bit. Because we don't want to use MVC, but just the web API, we need to remove the configured default route. To support Angular routing, we need to handle 404 errors: In case a requested resource was not found on the server, it could be a Angular route. This means we should redirect request, which results in a error 404, to the index.html. We need to create this file in the wwwroot folder later on. You need to have Node.JS installed on your machine, To get all the tools working. Now we can use npm install in the console to load all that stuff. This command automatically calls typings install as a NPM post install event. Webpack has two tasks in this simple tutorial. The first thing is to copy some dependencies out of the node_modules folder into the wwwroot folder, because static files will only be provided out of this special folder. We need Core.JS, Zone.JS, Reflect-Metadata and System.JS. The second task is to build and bundle the Angular2 application (which is not yet written) and all it's dependencies. We have two separate configurations for the mentioned tasks. This is not the best way how to configure Webpack. E.g. the Angular2 Webpack Starter or the latest Angular CLI, do the whole stuff with a more complex Webpack configuration. To run this configuration, just type webpack in the console. The first configuration writes out a few warnings, but will work anyway. The second config should fail, because we don't have the Angular2 app yet. The module collects all the parts of our app and puts all the components and services together. At least, we need to create a service which calls a ASP.NET Core web api. We need to create the API later on. If you start the app using dotnet run you can call the API using that URL: http://localhost:5000/api/persons/, you'll see the three persons in the browser as a JSON result. #9 That's It. Run the App. 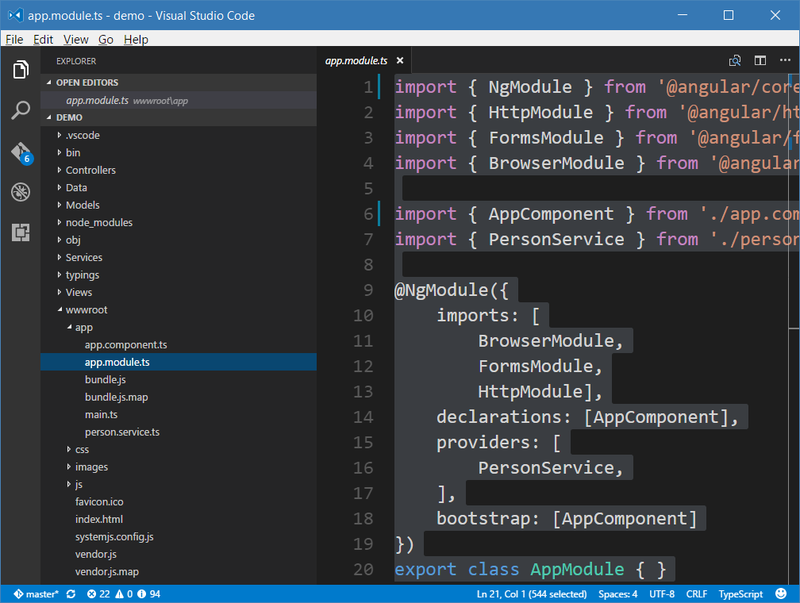 As you can see, hosting an Angular2 app inside ASP.NET Core web using this way is pretty much easier and much more light weight than using Visual Studio 2015. Aniway, this is the last post about combining this two technologies. Because this is just a good way, if you write a small application. For bigger applications you should separate the client application from the server part. The Angular2 app should be written using Anngular CLI. Working like this both parts are completely independent and it is much easier to setup and to deploy.